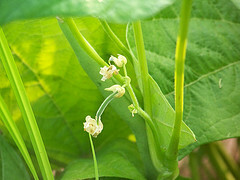 Green Bean Varieties - What's the Difference? 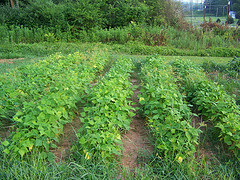 There are several green bean varieties available to the backyard vegetable gardener. Some are very similar and others have unique textures or colors or flavors. It is very common for a gardener to find a variety they like and stick with it, growing it year after year. We tend to plant a few different varieties, sticking with our favorites, and adding 1-2 others into the mix just to try them. Grean beans can be divided up into 2 main categories, pole or bush. Some varieties are available in both pole and bush types. We are often asked what our favorite varieties are. For pole beans, we like Rattlesnake - they are stringless and average 7" long. The pods are streaked with green and purple and the plants reach 8 feet tall, ready in 73 days. They have an old timey taste and produce well in our climate. 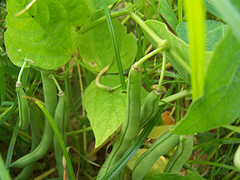 These beans are great for canning, and the beans inside the pods work well as dried beans. For bush beans, our favorite is Calima - they are a french filet type bean that starts off nice and thin like haricot vert. Ready in 55 days, this variety grows fast. If you let the beans grow a bit more, they reach a nice size for canning. 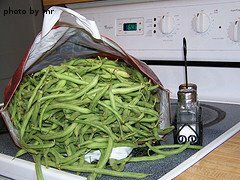 This variety is fairly heat tolerant and the dark green beans average 5" long when picked young, and 7+" long if you let them grow. We like the dual purpose of these beans. Here is a partial list of the more common green bean varieties.